I’m finally ready to move baby girl into her own room. I haven’t before now since I was still up now and again to her and the boys. However, now she’s getting disturbed when I toss and turn or get up to the boys or the bathroom. I think it’s time. She’s well past the 6 months stage, although I didn’t wait that long with Tyler and I’m sure Lucas was a lot older before I moved him into his own room. But the room is ready. After having two boys I decided to go for the pink theme, of course I did. 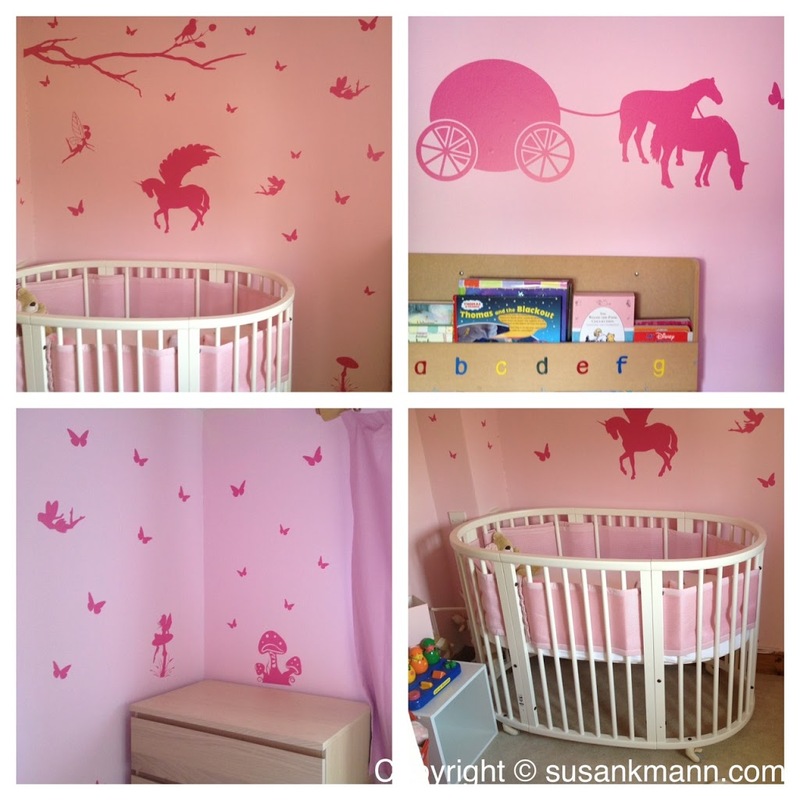 I went for pink walls, white ceiling with glow in the dark stars and a moon and pink decals. I painted on the boys room with characters as I mentioned in this blog post and it was a nightmare to come off. Especially as they grew and decided Mickey Mouse, Handy Manny and Winnie the Pooh were no longer cool. I thought I’d wait for a while see what Aria is into and then perhaps paint a mural or something on the walls. In the meantime I’ve went for a darker pink fairy theme. We have the horse and cart for the fairy princess, a gorgeous tree branch which I love, some unicorns, toadstools, loads of butterflies and fairies. Flying ones, sitting ones and standing ones. I love it. They were so easy to use to. I had the room decorated with the decals in less than 15 minutes and the effect I love. What do you think? I had two cot beds for the boys and planned on using one of them for the new baby, but both snapped as they had been stored in the lock-up and I guess dampness set in. Thankfully Aria wasn’t in it at the time. I was lucky to be able to purchase the Stokke Sleepi at a great price from Mothercare and I love it. I wish I’d had it for the boys. It looks great, is well made and it’s round, it’s perfect. Did I mention I loved it. I got a pink cot bumper from safe dreams, which is breathable. I already had the Tidy Books Bookcase as I’d gotten if for the boys and this was their playroom until I’d gotten the loft converted. I had some light coloured drawers, which has the changing mat on and a gorgeous bedside table which I love and has some really lovely furniture. This is perfect as I can put a light on it, I also her the sensor monitor and light. I could not sleep without the sensor monitor. I got a heart shaped lamp with a pink shade of course. And there is a wooden wardrobe. There is a tub with toys in it. I have a gorgeous bear rug, which was the boys. I don’t know where I got it from to be honest. I also have some small plastic drawers which house the nappies, wipes, etc. These are great and were the boys too. A cream carpet, I couldn’t do too much pink, could I? Ok, I went for a pink black out blind, an essential with a baby. The blackout blind not the pink and some light pink black out curtains. Apart from some teddies, that’s it for now. I really like the look of the room, but would love another opinion? Anything you’d add, remove or change?